Cutting Edge Stencils is consistently featured in prominent magazines and publications, as well as on TV and viral video sites. Our stencils are very popular among DIY home decorators. The projects feature stenciled accent walls, painted furniture, stenciled accent pillows and even stenciled tile floors. Take a look below and click on the thumbnails to read what all the hype is about! Our Alexa stencil is on the cover! Our Marrakech Trellis stencil looks fab in black over white on this bedroom wall, plus some Snowflake stencils for Christmas decor! Amazing stenciled backyard fence with Dandelion stencils! Stenciled floor rug with our Funky Wheel stencil on the cover! 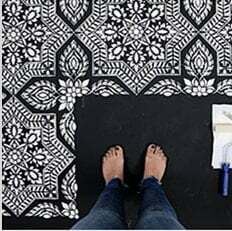 Stenciled floor rug with our Zinnia stencil is on the cover! Paint-a-pillow makes top 100 products list! Our Paint-a-Pillow is featured on Rachael Ray show! Designer Kim Myles shows you how to stencil a side table in just 2 minutes! Meg Caswell of HGTV’s Great Rooms created this sunny kitchen with our Hand Forged stencil, designed just for this show! Paint-A-Pillow is debuting on CityLine! Our Vintage paisley stencil looks fabulous on these blue walls!